” I am writing this letter to thank Fr. Jerold Cruz Mariastanislaus for his pastoral care of my uncle. I am very grateful for Fr. Cruz’s service and dedication towards my uncle, his family and to those in need of repentance and forgiveness. My uncle was diagnosed with stage IV lung cancer, a diagnosis he took very well. He started treatment two months after which (the treatments) made him very sick and kept him coming in and out of the hospital. My uncle was a one of a kind person; he always had a great spirit and made everyone around him feel special. (He) always made people smile. He taught us to help those in need without expecting anything in return. One thing that will always stay in my heart is that he saw the bright side of things. He was the best father, husband, son, uncle and friend anyone could ask for. His family requested pastoral care while he was in the hospital. Although he was not a churchgoer, he held to the principles of the Christian faith and because of that I knew that he was going to want to speak with Fr. Cruz. We were all thankful that my uncle had the opportunity to confess and receive communion. Having Fr. Cruz’s pastoral care while my uncle was in the hospital meant a lot to me, and I happened to be there most of the time when Fr. Cruz came in to bless my uncle. I will always greatly appreciate Fr. Cruz for his presence in our lives but especially the day my uncle was ready to depart with the Lord. Fr. Cruz received a call from the hospital that we requested a blessing and anointing before my uncle passed. That day was Fr. Cruz’s day off, but that didn’t matter. Fr. Cruz entered the room just in time to anoint my uncle. Fr. Cruz helped keep my uncle comfortable so that he could leave in peace. “This is a story of healing of my father at Kennedy University Hospital, Stratford. On March 2nd, my 87 year old father fractured his hip requiring surgery. Fr. 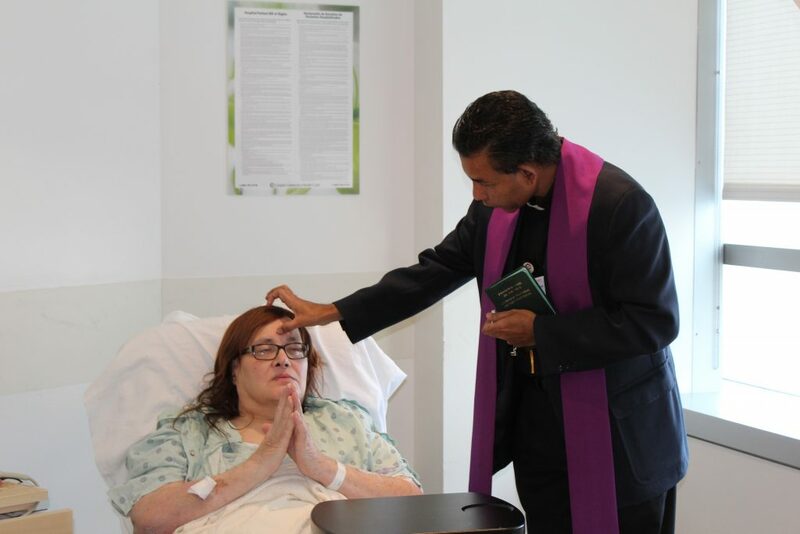 Wilson Paulose, the hospital chaplain, anointed him since I feared for his soul, should he die in surgery. Fr. Wilson reminded me that it is a sacrament of healing. After the surgery, my dad’s other medical conditions worsened and he needed ICU care because he had dangerously low BP requiring vasopressors and he also needed hemodialysis. My father wanted to go home to die. He was so depressed. “I have been in the hospital a little over a year now. At first you’re doing a lot of things keeping you busy. But after a while you start getting bored and lonely. My family can’t get over to visit due to medical problems. Thank goodness I have a dear friend that visits. We have been friends since we were 11 years old and now we are 70. One day a priest (chaplain) came in…and offered me communion, of course I said yes. After communion he pulled over a chair and spoke with me… He also told me about the Eucharistic Ministers…who offer communion to the patients and bring comfort which I thought was great. The next day a very nice lady came in and introduced herself as one of the associate chaplains from the diocese giving communion and asked me if I would like to receive that day, I said yes I would. We talked for a while. I found her very easy to talk to. She’s been coming every other day now and I can’t wait until she comes back. She has become a very nice friend and comforts me since my family can’t get here too often because of medical problems. Having both Father Tomy and Anne giving communion and visiting has become a heartwarming visit to wait for. Father Tomy and Anne have become good friends. Their prayers for me, my husband, and my cousin have meant a lot to me. Anne and I have become good friends and she tells me how to pray for my needs and receiving communion every day has given my heart something to smile about.